A lonely pup named Miya waits in a tiny cell for someone to take her home - because the little girl who desperately loves her was told she can't have her anymore. 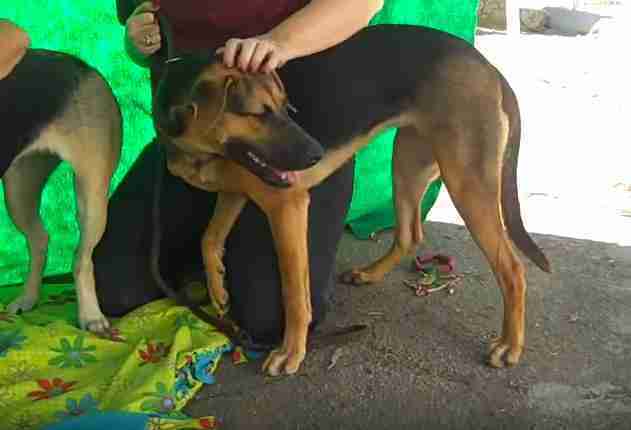 Miya and her sister Lyka are both 6-month-old German shepherd mix puppies who were given up to the Baldwin Park Animal Shelter in Los Angeles by their family. The puppies' owner told the shelter the dogs were destructive, but volunteers speculate he was simply not prepared to take care of a puppy. "Our best guess is that Miya's former owner didn't pay much attention to her (which is probably why she was destructive), so she's in need of leash and obedience training, as well as appropriate exercise and stimulation," United Hope For Animals, an organization that helps dogs from shelters find homes, wrote on its Facebook page. "She is smart and eager to please, so we think she will be a quick study." Sadly, when the man gave up these puppies, he was not only taking a home away from them, but also a pair of best friends for his daughter - a young girl who loves both dogs very much. The girl who raised Miya and Lyka has been visiting them at the shelter since the moment they were given up. Photographer John Hwang captured the girl hugging Miya through her enclosure in a touching display of love. "She knelt for a long time, heartbroken ... in front of a particular kennel. It held her beloved dog, a gentle 6-month-old German shepherd ... the girl raised her since she was a little puppy," Hwang wrote on his Facebook page. "Sadly, her father wouldn't allow her to keep the dog anymore, so she was left at the shelter." While the little girl is devastated that she no longer has her dogs, both Lyka and Miya have recently been adopted, a representative from the Baldwin Park Animal Shelter told The Dodo. Lyka was adopted Tuesday and Miya is scheduled to go to a new home on Wednesday. While it is sad the puppies were separated from their best friend, it's wonderful that they both have loving new homes to go to. Commenters on Facebook have said they sincerely hope Miya and Lyka's new families, whoever they may be, will allow the girl to visit them from time to time. It's important to make sure your family is prepared before welcoming new furry friends into your home. To learn about how to care for a new puppy, you can check out the ASPCA for more information.